United Teachers Los Angeles on Friday rejected the district’s latest offer, which would invest $130 million to lower class sizes and add 1,200 new staff members — teachers as well as nurses, counselors and librarians. The district is offering a 3 percent raise retroactive to 2017-18 and 3 percent for this year. UTLA wants a 6.5 percent retroactive raise, a full-time nurse in every school, more special education teachers and expanded charter school oversight, among other demands. While some parents kept their kids out of school to support teachers, others said they didn’t have that luxury. “I want to support the teachers, but I have to work and my daughter has to come to school,” said Josefina, who didn’t want to give her last name, as she dropped off her daughter at Sunrise Elementary, another east side school. 2) There were about 20,000 participants in UTLA’s downtown march. L.A. Unified hired about 400 substitute teachers to fill in for striking teachers and purchased more computer-based education programs. District 4 board member Nick Melvoin told LA School Report last month the district has about 2,000 credentialed staff, such as counselors and people from the central office, who can also step in. 3) There were no safety issues reported. One tweet, however, showed strikers blocking a truck at the entrance to one school. 4) Charter schools were a central talking point. UTLA President Alex Caputo-Pearl in a morning news conference re-upped his call for a cap on charter schools and stronger charter transparency and accountability. “We need to throw privatization schemes … into the trashcan right now,” he told the crowd outside Marshall High School. 5) Politicians, celebrities & students chimed in — many supporting UTLA. Two prominent national teacher union leaders joined Los Angeles educators on the picket lines Monday: American Federation of Teachers President Randi Weingarten and National Education Association President Lily Eskelsen García. Support also poured in via Twitter from numerous celebrities, progressive organizations and politicians — including a few Democrats said to be mulling presidential runs in 2020. Tom Perez, the chair of the Democratic National Committee, said in a statement of support, “I stand with the Los Angeles teachers.” Many teachers and union leaders also shared photos of themselves wearing red in support of UTLA. 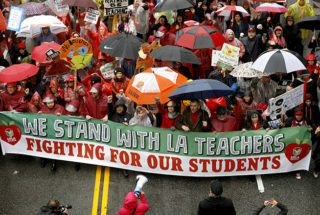 Los Angeles Mayor Eric Garcetti tweeted a similar message on the eve of the strike, urging “both parties to keep working to reach an agreement as soon as possible so teachers and students can get back to the classroom.” He didn’t join the picketers Monday, but tweeted out a photo with children, saying he was closely monitoring recreational centers that were offering support. Garcetti is also considering a run for the White House. *This article has been updated to add attendance figures and Tony Thurmond tweet.